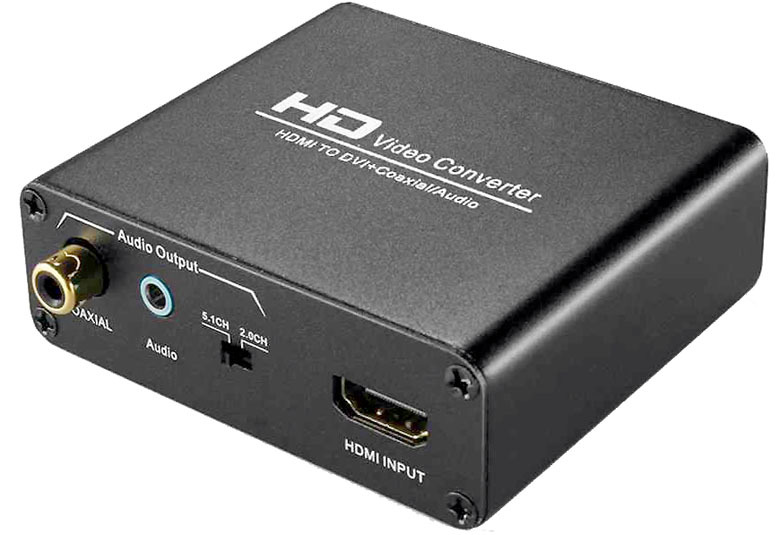 This HDMI to DVI + audio converter/extractor is designed to separate the digital video/audio signals embedded from HDMI sources into DVI-D video with individual audio output. 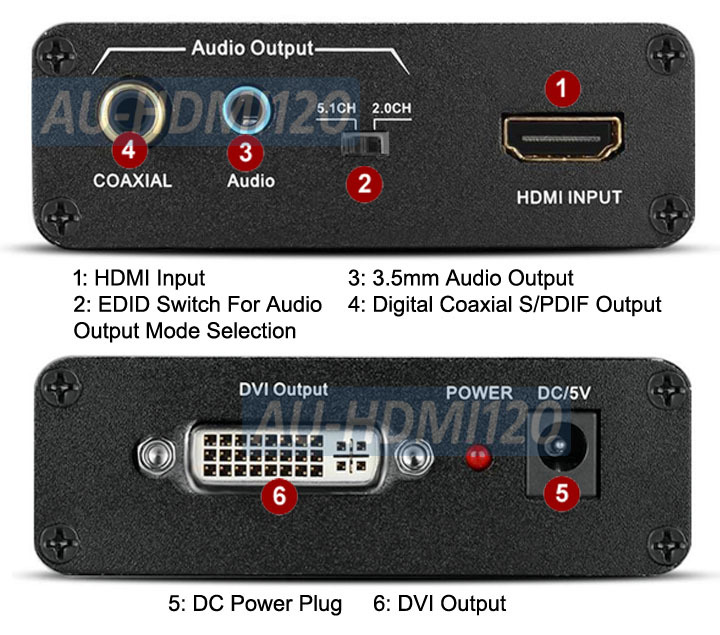 It is a great solution for connecting HDMI video/audio feed to those LCD DVI monitors with no speakers built in. This HDMI converter allows users to extract the embedded audio from the HDMI feed and provide both analog stereo and digital S/PDIF audio output. So users can choose play the digital or analog stereo out from this HDMI processor through their favorite speaker system, audio amplifier or existing home theater system for better sonic performance while the video can be displayed on a DVI or HDMI monitor at the same time. [Note]: the DVI output connection in not required to receive audio output. This HDMI audio extractor also supports direct pass-through of all HDMI 3D video and deep color modes. The HDMI input supports resolutions up to 1080p/60 and computer resolutions up to 1920x1080 pixels. HDMI and DVI contains the same video definition. This HDMI to DVI-D adapter can be used to separate HDMI video audio signal into distinct DVI-D video with audio out, in turn providing a cost-effective solution for those PC DVI monitors with no speaker built in since the extracted HDMI audio can now be played through multimedia speakers, stereo system or home theater receiver. 5.1 Surround Mode: Switch to 5.1 mode for the HDMI source to output bitstream audio such as Dobly 5.1, DTS 5.1 channels or LPCM 5.1 through the digital coaxial port. 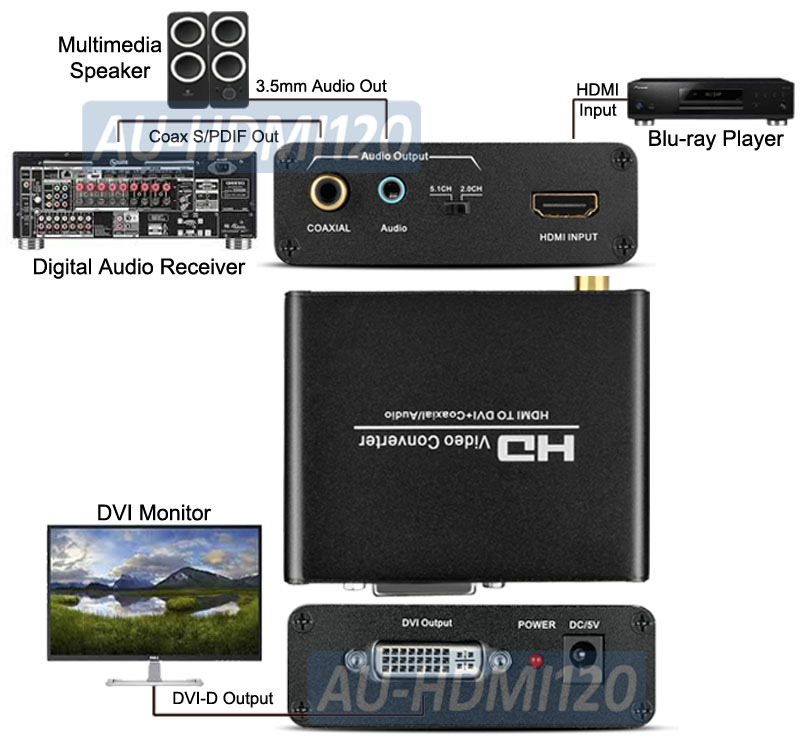 2CH LPCM Mode: Switch to 2CH LPCM mode for the HDMI source to output analog stereo output through its 3.5mm port. This HDMI audio converter can strip the compressed digital audio embedded in HDMI feed such as Dolby Digital, AC3 and DTS 5.1 through its coaxial S/DPIF port for digital audio out. The supported digital audio output formats include all bitstream surround sound such as Dolby 5.1, DTS 5.1 or digital stereo such as LPCM 2CH. This devices can also extract the digital 2CH PCM stereo audio signal from the HDMI input and decode it into analog stereo output through its 3.5mm headphone style port. The converter also amplifies and equalizes incoming TMDS data before re-transmitting it in optimal quality regardless of its original signal strength. Its repeater function automatically equalize and compensate for HDMI/ DVI signal loss during the cable run and also extends the cable reach to maximum distance with the same signal quality maintained all the way and delivered to the end HD display. Maximum input/output cable extension range up to 15m/ 50ft for 1080p at 8-bit transmission or 10m/32ft for 1080p at 12-bit transmission. Converts the digital video and audio signals embedded from HDMI sources into DVI-D video and digital/analog audio output separately. Great solution for connecting HDMI video/audio feed to those LCD DVI monitors with no speakers built in. Supports uncompressed audio such as PCM stereo through S/PDIF coaxial out or analog 3.5mm stereo out. Supports compressed bitsream surround audio such as Dolby 5.1, Dolby Digital, AC3 and DTS 5.1 through digital S/PDIF coaxial output. Supports max HD or digital RGB resolutions up to 1080p and 1920 x 1080 pixels. Supports direct HDMI pass-through of all 3D digital video and deep color content through its DVI port. DVI/ HDMI output connection in not required to receive audio output. Easy EDID dip switch selection. Users can easily control their HDMI source through the dip switch to send out the desired digital audio format for decoding and conversion by the converter. HDMI signal amplification and equalization supported. Supports HDMI input with HDMI output with maximum cable run up to 50ft or 15m. Power Supply: 110V ~ 240V DC with DC 5V 1A output.